Encore! 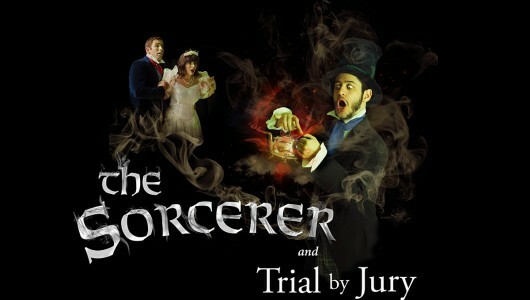 presents a double bill: Gilbert & Sullivan’s The Sorcerer and Trial by Jury, to be presented at the Hirsch Theatre, Beit Shmuel, Jerusalem, 25 December 2013– 2 January 2014. The Sorcerer (המכשף) is Gilbert & Sullivan’s first two-act opera. Originally produced in 1877, it became the model on which the subsequent and highly successful series of Savoy Operas was based. A parody of Donizetti’s The Elixir of Love and with orchestral effects reminiscent of Weber’s Der Freischutz, The Sorcerer depicts a country wedding that is disrupted by a magician adding a love potion to the teapot so that everyone falls madly in love with the first person he or she sees. Of course, all the couples are mismatched, and it requires an ultimate sacrifice to break the spell and set things right – in time for the final curtain. The Sorcerer will be followed by Trial by Jury (צחוק ומשפט), an irresistible send-up of a breach-of-promise case in a topsy-turvey courtroom. The two operas were paired together when they were revived by Gilbert & Sullivan in 1885. Staged by Robert Binder, with musical direction by Paul Salter, choreography by Judy Brown, and scenic design by Roxane Goodkin-Levy, the double bill comes in a line of solid successes presented by Encore Educational Theatre Company. Performances on 25, 26, 31 December and 2 January at 8:00 p.m., 1 January at 5:00 and 8:30 p.m. Tickets available through the Beit Shmuel box office, (02) 620-3463.